The increasing demand for video quality and resolution makes the UHD and 4K videos became more and more popular. 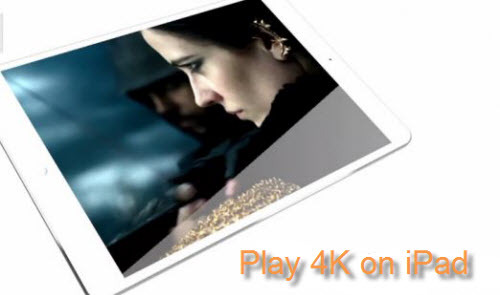 Have download some of your favorite 4K resolution films or movies from popular video-sharing sites or capture some great 4K video footage with your handhelp 4K device recorders, how to play those 4K video on new iPad (2017), iPad Pro, Air or Mini tablet? Will iPad (new iPad 2017) play 4K video? "I'm new to iPad Air. Simple question, is it possible to play 4k video? I've tried YouTube but no luck. The highest setting I can set it to is 1080p. Any advice is greatly appreciate !" Apple has secretly added 4K video support to some of its newly available iPad models including iPad Pro, iPad Mini 4 and iPad Air 2, it also means that only those 3 iPad models have the ability to playback 4K resolution video. If you are using the previous iPad models to play 4K video, your iPad will automatically downscale 4K to 1080p, however, due to additional processing the video player software on your iPad has to do to display the 4K video, the results may be worse than if you play native 1080p video. In this case, it would be much ideal for you to use a third-party 4K video compressor software such as Pavtube Video Converter to compress 4K video to 1080p, so that you can smoothly view 4K video those iPad models including new iPad (2017) without 4K media playback capability with perfect quality. If the 4K video in your hand don't comly with any of the standards listed above, iPad will fail to import the 4K video or you won't get a smooth playback process or a perfect playback quality. 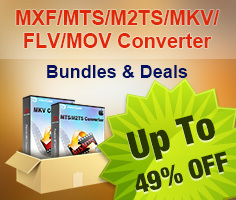 If you are looking for a simple and effective solution to fix this format and settings incompatible issue, we highly recommend Pavtube Video Converter for Windows/Mac to you, the program has enhanced media compatibility with all virtually all 4K video file formats including 4K AVI, 4K WMV, 4K MP4, 4K MOV, 4K MXF, 4K AVCHD, 4K H.264 MP4/MOV, 4K H.265 MP4/MKV, etc. As for the important output options, you can use the program to generate iPad Pro/Air 2/Mini 4 playable 4K H.264 files formats and then adjust the output profile parameters such as video codec, resolution, frame rate, bit rate and audio codec, bit rate, sample rate and channels, etc to make them adapt with iPad best playback settings listed above. How to Compress and Convert 4K Video to iPad (new iPad 2017)? Step 1: Load 4K video files into the program. 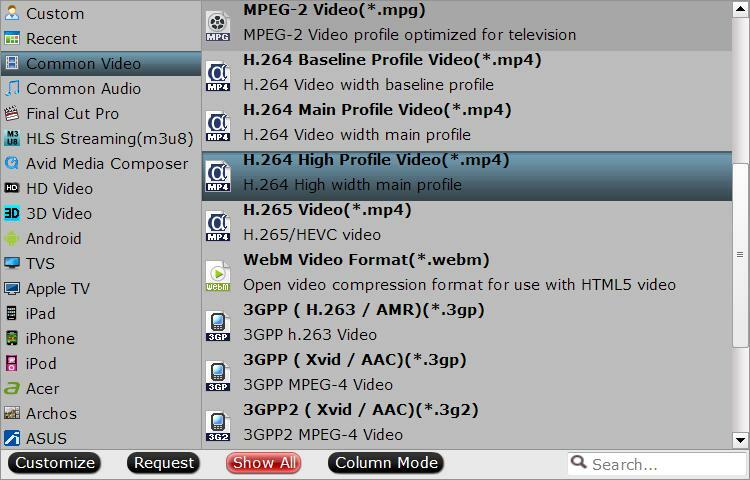 Start the program on your computer, on the main interface, click "File" > "Add Video/Audio" or "Add from Folder" to load 4K source files into the program. 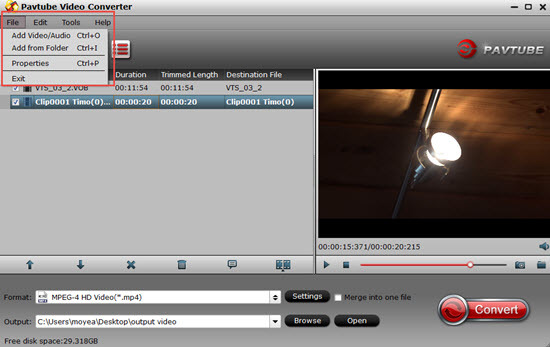 You can also directly drag the files to the program's main panel. If you are using the previous iPad model, it would be much ideal for you to compress 4K video to 1080p by output iPad playable 1080p file formats by following "H.264 HD Video(*.mp4)" under "HD Video" main category, make sure to change the output file resolution as "1920*1080" or "1080*720" in the program's "profile settings" window. If you try to play unsupported 4K video on iPad Pro/Air 2/Mini 4, then you can use the program to output those iPad models playable 4K video from "Common Video" > "H.264 High Profile Video(*.mp4)". Then, click "Settings" on the main interface to adjust output profile settings to make them fit with your iPad, you can set the output video codec as "h264", audio codec as "aac", video frame rate as "30fps", audio sample rate as 48000hz, audio bit rate as 160000bps or audio channels as stereo or 5.1 channles. After all setting is completed, hit right-bottom "Convert" button to begin the conversion from 4K video to iPad supported file formats and settings conversion process. When the conversion is completed, feel free to sync files from iTunes to iPad Pro/Air 2/Mini 4/new iPad (2017) for watching on the move.